Cross-posted on Jewess. 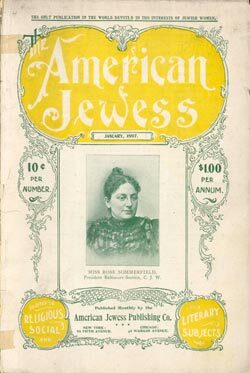 Though The American Jewess was an American magazine, it included a fair amount of foreign correspondence pieces, as was not uncommon for 19th century publications. In honor of Passover (three more days to clean! ), this week's featured TAJ article is "Passover Eve in Petticoat Lane" an account of the Passover prep in London's Jewish marketplace. - English Jewesses were pretty, in an "oriental" sort of way. - The American Jewess took a perverse, superior sort of delight in the quaint, lower class young Jewess (what exactly is meant by "a truly Jewish shrug" anyways?) but one wonders how she would have felt about the little girl's mother. Such inter-Jewish class issues may seem like a thing of the past -- aren't we all upper middle class? -- but this piece reminds me a lot of my third grade field trip to the Lower East Side, which just happens to be where I grew up, and how, standing in front of the world-famous Guss's pickles, my best friend, who lived uptown, said, "What a scuzzy neighborhood." Anyway, here is "Passover Eve in Petticoat Lane," posted below in its entirety with noteworthy bits highlighted and underlined. Or read it on The American Jewess site (linked above) in PDF, image or text form. Namerow, Jordan. "The American Jewess: Passover in 19th Century London." 15 April 2008. Jewish Women's Archive. (Viewed on April 23, 2019) <https://jwa.org/blog/TAJ-Passover-in-19th-Century-London>.